This is surprising, considering that individuals are our nation’s primary bill payers. Income taxes paid by individuals account for 49 percent of all federal tax revenues, which are projected to be $2.99 trillion in 2016. Other tax revenue comes from payroll taxes paid jointly by workers and employers, accounting for 33 percent and corporate income taxes paid by businesses, which make up 9 percent. 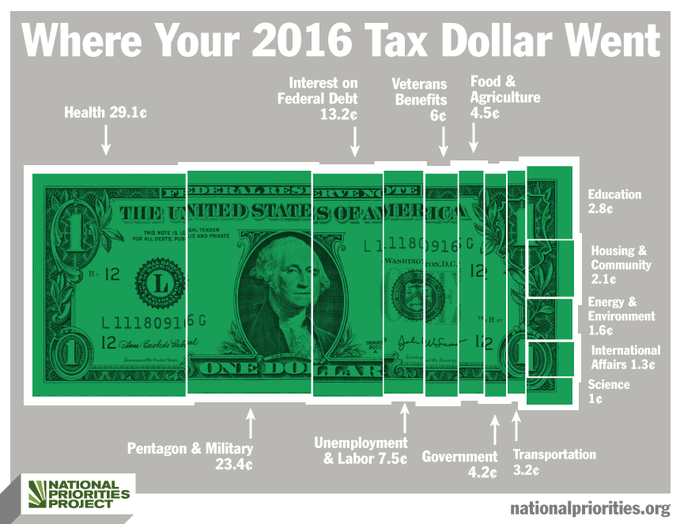 Where your tax dollars went in 2016. 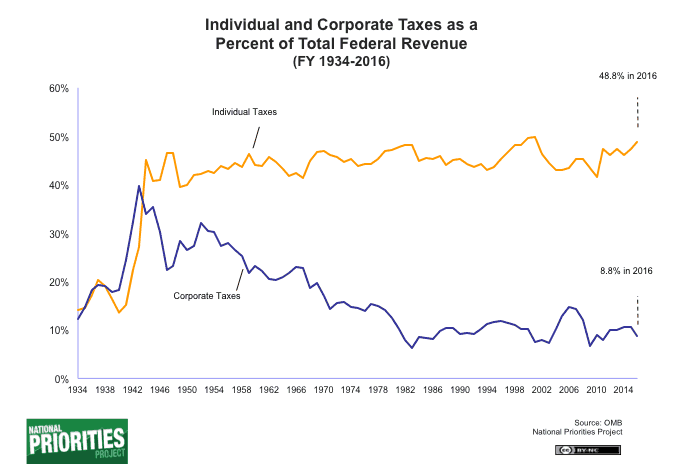 Corporate and private taxes paid to federal government. 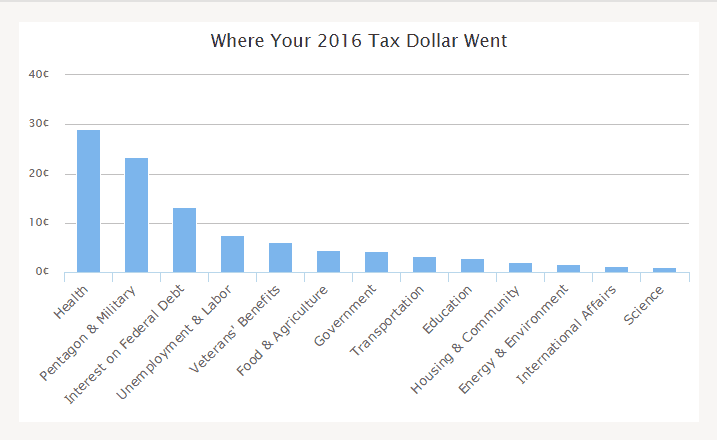 Using a customized tax receipt calculator, you can find out exactly how the federal government spent each penny of your 2016 taxes. Look up your tax receipt right now — is your money going where you think it should? Across the United States, the average taxpayer paid $14,051 in 2016 federal income taxes. Health care received the largest share of that sum, $4,090, for programs like Medicaid and the Children’s Health Insurance Program, followed by the military, which received $3,290. Meanwhile, only $398 went to education programs. NPP has also looked at each state’s average taxpayer and calculated where taxes from every state are going. These state-by-state tax receipts show the state with the highest average taxes paid (Connecticut, $22,787) and lowest (West Virginia, $8,607) and everything in between. Although these state receipts show the average taxpayer’s contribution to the budget, Americans don’t all pay taxes equally. In theory the tax code is progressive, meaning those who make more money pay higher tax rates — yet in practice that’s not always the case. As Warren Buffett made famous, billionaires sometimes pay lower rates than middle-class workers. And some corporations, like General Electric and PG&E, have gotten away with paying zero federal income taxes, even when they make billions in profit. That’s because the tax code is chock-full of tax breaks. According to Pew Research, tax breaks overwhelmingly go to top earners and corporations, and they add up. “We counted 118 individual breaks with a net total estimated cost in fiscal 2016 of nearly $1.15 trillion, compared with 80 corporate breaks totaling $185.2 billion.” That’s in part because tax deductions — one important type of tax break — are far more likely to benefit the wealthy than middle- and low-income folks, because deductions only offer savings to taxpayers who itemize deductions. Only 16 percent of households making between $25,000 and $30,000 itemize tax deductions, while nearly 100 percent of those making over $200,000 itemize. This post first appeared on OurFuture.org in 2014 and has been updated with figures for 2016.